RRC Pre-service Teachers infusing computational thinking into their lesson designs. 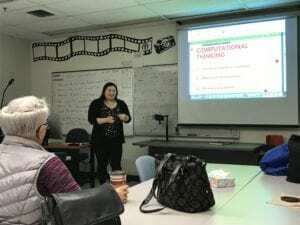 Dr. Eva Brown and her students in the Business and Technology – Teacher Education Program welcomed Cheryl Prokopanko from the Learning Support and Technology unit of Manitoba Education and Training into their classroom today. Dr. Brown and Ms. Prokopanko are part of the development team for the Committee for Infusing Computational Thinking Through Coding into Literacy with Information and Communications Technology Across the curriculum. Exciting things are happening in Education here in Manitoba! Red River College is proud that our grads will be at the forefront of this emerging trend in K-12 classrooms.